Search.searchwfaa.com is a browser hijacker that tries to redirect you to sponsored websites. It’s one of those annoying potentially unwanted programs that gets into your system via free software and messes with your browser’s settings. If you are not careful when you install freeware, you might just end up with this hijacker. We should note, however, that hijackers are not malicious computer viruses. They do not aim to harm your computer but that does not mean that they will not expose you to danger. Those redirects that it causes could lead you to possibly dangerous websites where malware is just waiting for an opportunity to enter your computer. You need to make sure that you delete Search.searchwfaa.com and leave no leftovers behind. Why should you remove Search.searchwfaa.com? You must have allowed Search.searchwfaa.com to enter when you installed freeware. This is not uncommon and many developers take advantage of the fact that users carelessly install programs. Items like Search.searchwfaa.com are attached to free software and can install alongside it if you do not prevent it. The only way to prevent it is to deselect them. And you cannot do that in Default settings because they will not even show you that something is attached. So what you need to do is choose Advanced (Custom) settings. You can then deselect all added items and prevent them from installing this way. 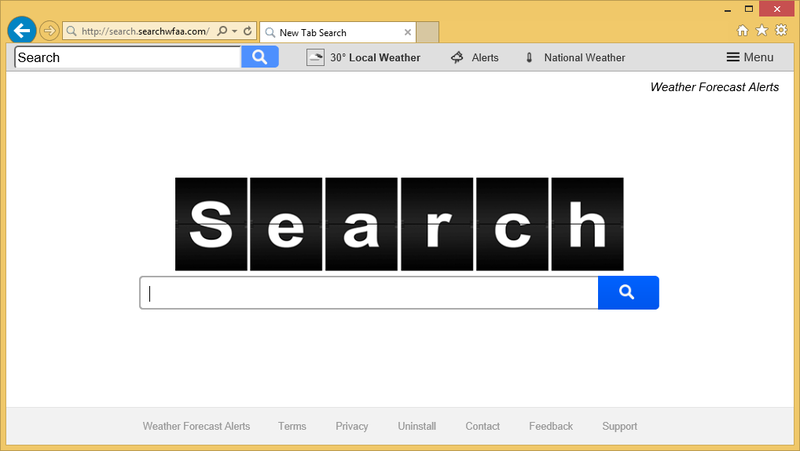 This is much easier and less time-consuming than it would be to uninstall Search.searchwfaa.com. You will notice that your browser’s settings have been changed. Search.searchwfaa.com suddenly became your homepage and new tabs. This means that every time you open your browser (be it Internet Explorer, Google Chrome or Mozilla Firefox) you will be directed to Search.searchwfaa.com. The only way to undo the setting changes would be to delete Search.searchwfaa.com from your computer and then manually change the settings back to what they were. The provided search engine seemingly generates results via Yahoo but if you inspect closer, you will realize that it says Safebrowser Yahoo. This means that this hijacker will insert sponsored websites into the results so that it can redirect you to those sponsored web pages. That is the main purpose of Search.searchwfaa.com, to generate pay-per-click revenue for those websites. The thing about redirects is that you might be forced to enter a malicious site and accidentally download malware. So as to not to put your computer in danger, we suggest you make sure you uninstall Search.searchwfaa.com. To remove Search.searchwfaa.com, you can choose from two options. You can erase Search.searchwfaa.com using a professional removal tool. It will be the quickest way as the program will do everything for you. If you opt for manual Search.searchwfaa.com removal, you will need to locate and eliminate Search.searchwfaa.com yourself.